DILMA ROUSSEFF, President of Brazil, denounced the terrorist attack that had taken place in Nairobi, before drawing attention to the global network of electronic espionage, which, she said, had directly affected her country. She highlighted that citizens’ personal data, corporate information — often of high economic and even strategic value — and diplomatic information had been intercepted, as well as communications of the Office of the President. “Tampering in such a manner in the affairs of other countries is a breach of international law and an affront to the principles that must guide relations among them, especially among friendly nations,” she declared. The right to safety of citizens of one country, she said, could never be guaranteed by violating fundamental human rights of citizens of another. As many other Latin Americans, she had fought against authoritarianism and censorship, and she could not be defend the right to privacy — of individuals and the nation itself. In the absence of privacy, there could be no true freedom of expression and opinion, and therefore, no effective democracy. In the absence of respect for sovereignty, there was no basis for the relationship among nations. She demanded from the United States’ Government explanations, apologies and guarantees that such procedures would never be repeated. In order to prevent cyberspace from being used as a weapon of war, she presented proposals for a civilian multilateral framework for the governance and use of the Internet, capable of ensuring such principles as freedom of expression, privacy of the individual and respect for human rights, as well as the construction of inclusive and non-discriminatory societies. 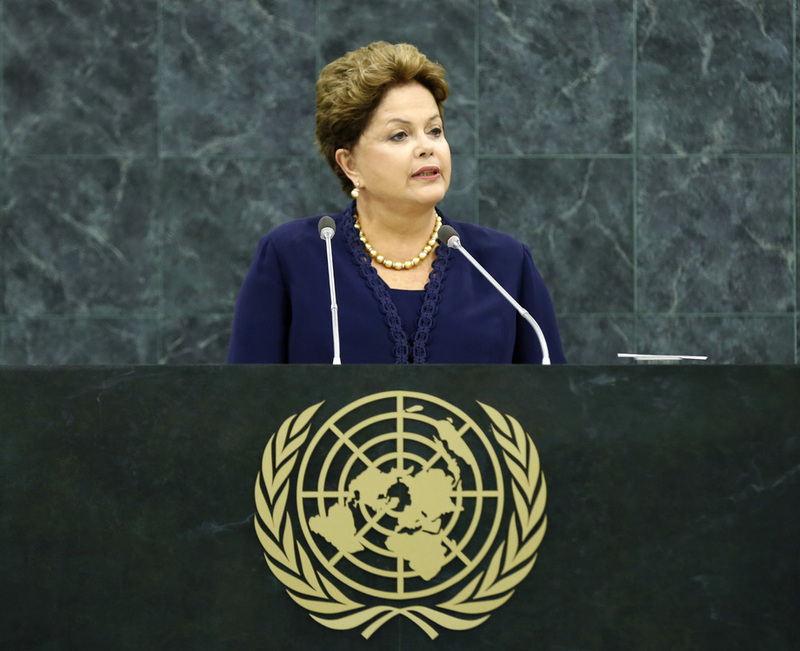 She welcomed the choice of the post-2015 development agenda as the theme of the current session, and highlighted the commitment made by Brazil in that regard. She spoke about the adoption of a socially inclusive economic model based on generating employment, strengthening small-scale agriculture, expanding credit, increasing the value of salaries and developing a vast social protection network, through the Borsa Familia (Family Stipend) Program. Recalling the outcome of the Rio+20 Conference, she welcomed the central role assigned to social inclusion and eradication of extreme poverty in the post-2015 development agenda. She then listed five major pacts launched in Brazil to support social inclusion, which addressed issues of corruption, urban transportation, taxes, health and especially education. In that connection, she underscored Brazil’s commitment to earmark 75 per cent of all petroleum royalties to the education sector. Speaking on behalf of the peoples of Brazil, she reiterated their support to the reform of the International Monetary Fund (IMF), whose governance should reflect the weight of emerging and developing countries in the world economy. She also addressed the issue of Security Council reform, deeming its limited representation an “issue of grave concern”. Only the expansion of the number of permanent and non-permanent members and the inclusion of developing countries in both categories would correct the Council’s “deficit of representation and legitimacy”. Turning to the Syrian crisis, she said: “We must stop the death of innocent civilians, of children, women and the elderly. We must cease the use of arms — conventional or chemical — by the Government or the rebels.” There was no military outcome, she stressed, adding that the only solution was through negotiation. Syria’s decision to adhere to the Chemical Weapons Convention and to immediately apply its provisions was “of great importance” and instrumental to overcoming the conflict and contributing to a world free of those weapons. Their use, she proclaimed “is heinous and inadmissible under any circumstance”. For that reason, she supported the agreement reached between the Russian Federation and United States, adding her repudiation for unilateral interventions, without Security Council authorization, which, she said, would only worsen the political instability in the region and increase human suffering. She said that a durable peace between Israel and Palestine took on new urgency in view of the changes occurring in the Middle East. The time had come to heed the legitimate aspirations of the Palestinians for an independent and sovereign State, and to realize the wide international consensus for the two-State solution. She hoped current negotiations would bring about practical and significant results. She concluded her intervention by appealing for a convergence of political wills to sustain multilateralism, which was at the core of the United Nations system.